The Feijoa, also known as pineapple guava or guavas teen, is an evergreen shrub or small tree, 1 – 7 metres in height, originating From the highlands of northern Brazil and parts of Colombia, Uruguay and northern Argentina. It has been spotted in Georgia and both Flowering and Fruiting in Lafayette, Louisiana and in Charleston, South Carolina, and California. It is widely cultivates as a garden plant and Fruiting tree in New Zealand, and can be Found as a garden plant in Australia. The Fruit matures in autumn and is green, ellipsoid – shaped and the size of a chicken egg. It has a sweet, aromatic Flavour. The Flesh is juicy and is divided into a clear jelly – like seed pilp and a Firmer, slightly gritty opaque Flesh nearer the skin. The Fruit drops when ripe, but can be picked From the tree prior to the drop to prevent bruising. The genus, also called Feijoa, is monotypic. Like the closely – related guava, the Fruit pulp has a gritty texture which is utilised in some natural cosmetic products as an exfoliate. Feijoa Fruit have a distinctive smell. The ester methyl benzoate smells strongly of Feijoas and the aroma of the Fruit is caused mostly by this and other closely related esters. The Fruit is usually eaten by cutting it in half, then scooping out the pulp with a spoon. The Fruit have a juicy sweet seed pulp, and slightly gritty Flesh nearer the skin. The Flavour is aromatic and sweet. If the utensils needed to eat it this way are not available, the Feijoa can be torn or bitten in half, and the contents squeezed out and consumed. An alternative is to bite the end off and then tear the Fruit in half length ways, exposing a larger surface with less curvature. The teeth can then scrape the pulp out closer to the skin, with less wastage. They can even be eaten whole, with only the junction to the plant cut off. The skin is sour and bitter, but provides a nice balance to the sweet pulp. Still, this is a less common method in some countries, but in Latin America, the Fruit’s homeland, it is often eaten this way. 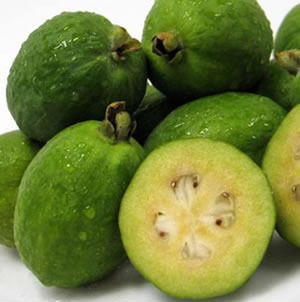 A Feijoa can also be used to make Feijoa wine or cider and Feijoa infused vodka. It is also possible to buy Feijoa Yogurt, Fruit drinks, jam, ice cream, etc. in New Zealand. The Feijoa can also be cooked and used in dishes where one would use stewed Fruit. It is popular ingredient in chutney. Fruit maturity is not always apparent From the outside as the Fruit remain green until they are over mature or rotting. Generally the Fruit is at its optimum ripeness the day it drops From the tree. While still hanging it may well prove bitter. Once Fallen Fruit very quickly become overripe, so a daily collection of Fallen Fruit is advisable during the season. When the Fruits are immature the seed pupl is white and opaque, becoming clear and jelly – like when ripe. Fruits are at their optimum maturity when the eed pulp has turned into a clear jelly with no hint of browning. Once the seed pulp and surrounding Flesh start to brown, the Fruit is over mature and shouldn’t be eaten. However, these over mature but not rotten Fruits can be used to make a delicious juice very popular in places like the Colombian Highlands. The pink to white Flowers petals have a delightful Flavour, are crisp, moist, and Fleshy. Ripe Fruit is very prone to bruising; maintaining the Fruit in good condition For any length of time is not easy. This, along with the short period of optimum ripeness, probably explains why Feijoas, although delicious, are not widely exported, and where grown commercially are often only sold close to the source of the crop. Feijoas can be cool – stored For approximately a month and still have a Few days of shelf life at optimum eating maturity. They are also able to be put in the Freezer up to one year without a loss in quality. Because of the relatively short shelf life store keepers need to be careful to replace older Feijoas regularly to ensure high quality. In some countries, Feijoas can also be purchased at roadside stalls, often at lower price. Some grafted cultivars self Fertile. Most are not, and require a pollenizer. Seedlings may or may not be of usable quality, and may or may not be self Fertile. Seedlings may or may not be of usable quality, and may or may not be self Fertile. In New Zealand, the pollinators are medium sized birds such as the Silvereye in the cooler parts of the South Island, the blackbird or the Indian Myna Further North, which Feed on the sweet, Fleshy petals of the Feijoa Flower. In some areas where the species has been introduced, it has been unproductive due to lack of pollinators. In Northern California, robins, mockingbirds, hummingbirds, starlings, scrub jays, towhees and grey squirrels Feast on the petals and can be assumed to be assisting with pollination. Honey bees also visit the Flowers. Nice info. I like FEIJOA because of its strong taste.